(Nanowerk News) Engineers at Saarland University have taken a leaf out of nature’s book by equipping an artificial hand with muscles made from shape-memory wire. The new technology enables the fabrication of flexible and lightweight robot hands for industrial applications and novel prosthetic devices. The muscle fibres are composed of bundles of ultrafine nickel-titanium alloy wires that are able to tense and flex. The material itself has sensory properties allowing the artificial hand to perform extremely precise movements. The research group led by Professor Stefan Seelecke will be showcasing their prototype artificial hand and how it makes use of shape-memory ‘metal muscles’ at HANNOVER MESSE – the world’s largest industrial fair – from April 13th to April 17th. The team, who will be exhibiting at the Saarland Research and Innovation Stand in Hall 2, Stand B 46, are looking for development partners. 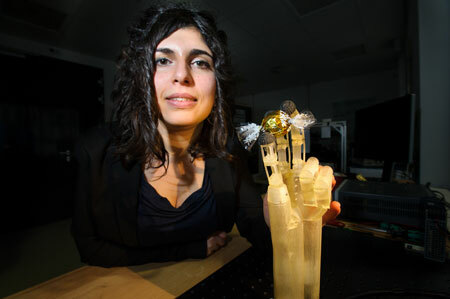 Filomena Simone, an engineer in the research team led by Professor Stefan Seelecke, is working on the prototype of the artificial hand. The hand is the perfect tool. Developed over millions of years, its ‘design’ can certainly be said to be mature. The hand is extraordinarily mobile and adaptable, and the consummate interaction between the muscles, ligaments, tendons, bones and nerves has long driven a desire to create a flexible tool based upon it. The research team led by Professor Stefan Seelecke from Saarland University and the Center for Mechatronics and Automation Technology (ZeMA) is using a new technology based on the shape memory properties of nickel-titanium alloy. The engineers have provided the artificial hand with muscles that are made up from very fine wires whose diameter is similar to that of a human hair and that can contract and relax. ‘Shape-memory alloy (SMA) wires offer significant advantages over other techniques,’ says Stefan Seelecke. Up until now, artificial hands, such as those used in industrial production lines, have relied on a lot of complex background technology. As a result they are dependent on other devices and equipment, such as electric motors or pneumatics, they tend to be heavy, relatively inflexible, at times loud, and also expensive. ‘In contrast, tools fabricated with artificial muscles from SMA wire can do without additional equipment, making them light, flexible and highly adaptable. They operate silently and are relatively cheap to produce. And these wires have the highest energy density of all known drive mechanisms, which enables them to perform powerful movements in restricted spaces,’ explains Seelecke. The term ‘shape memory’ refers to the fact that the wire is able to ‘remember’ its shape and to return to that original predetermined shape after it has been deformed. ‘This property of nickel-titanium alloy is a result of phase changes that occur within the material. If the wire becomes warm, which happens, for instance, when it conducts electricity, the material transforms its lattice structure causing it to contract like a muscle,’ says Seelecke. The engineers use ‘smart’ wires to play the role of muscles in the artificial hand. Multiple strands of shape-memory wire connect the finger joints and act as flexor muscles on the front-side of the finger and as extensor muscles on the rear. In order to facilitate rapid movements, the engineers copied the structure of natural human muscles by grouping the very fine wires into bundles to mimic muscle fibres. These bundles of wires are as fine as a thread of cotton, but have the tensile strength of a thick wire. ‘The bundle can rapidly contract and relax while exerting a high tensile force,’ explains Filomena Simone, an engineer who is working on the prototype of the artificial hand as part of her doctoral research. ‘The reason for this behaviour is the rapid cooling that is possible because lots of individual wires present a greater surface area through which heat can be dissipated. Unlike a single thick wire, a bundle of very fine wires can undergo rapid contractions and extensions equivalent to those observed in human muscles. As a result, we are able to achieve fast and smooth finger movements,’ she explains. Another effect of using the shape-memory metal wires is that the hand can respond in a natural manner when someone intervenes while a particular movement is being carried out. This means that humans can literally work hand-in-hand with the prototype device. A semiconductor chip controls the relative motions of the SMA wires allowing precise movements to be carried out. And the system does not need sensors. ‘The material from which wires are made has sensor properties. The controller unit is able to interpret electric resistance measurement data so that it knows the exact position of the wires at any one time,’ says Seelecke. This enables the hand and the fingers to be moved with high precision. The research team will be exhibiting their system prototypes at HANNOVER MESSE 2015 and showcasing the potential of the technology by performing hand grasps and the controlled movement of individual fingers. The researchers want to continue developing the prototype and improve the way in which it simulates the human hand. This will involve modelling hand movement patterns and exploiting the sensor properties of SMA wire.